Welcome to Fairy Tale Wool! 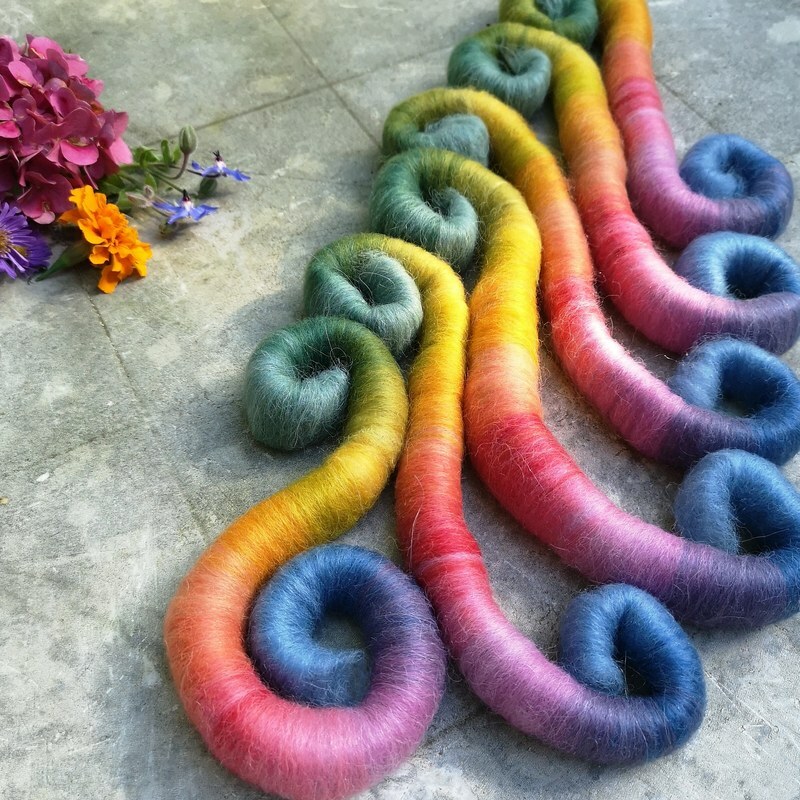 If you are interested in naturally dyed, unspun wool roving, silk and other protein fibers as well as art batts, rolags and fiber arts, this is the place to be. For nearly 14 years I have been fascinated by what nature provides for the creative realm. The idea to dye with natural dye substances was inspired by my close connection to our local Waldorf (Steiner) school. Influenced by German naturalist, biologist and poet, Wolfgang von Goethe, and deeply steeped into the seasonal cycles, this school system provides an indepth understanding of how colours are created and how they effect us on every level of our being. Unlike synthetic colours, which are mono-chromatic, natural dyes create a variety of colours in each dye bath, and our imagination creates the shades that we want (or need) to see. And unlike synthetic colours, each shade goes harmonically with every other shade, never clashing. 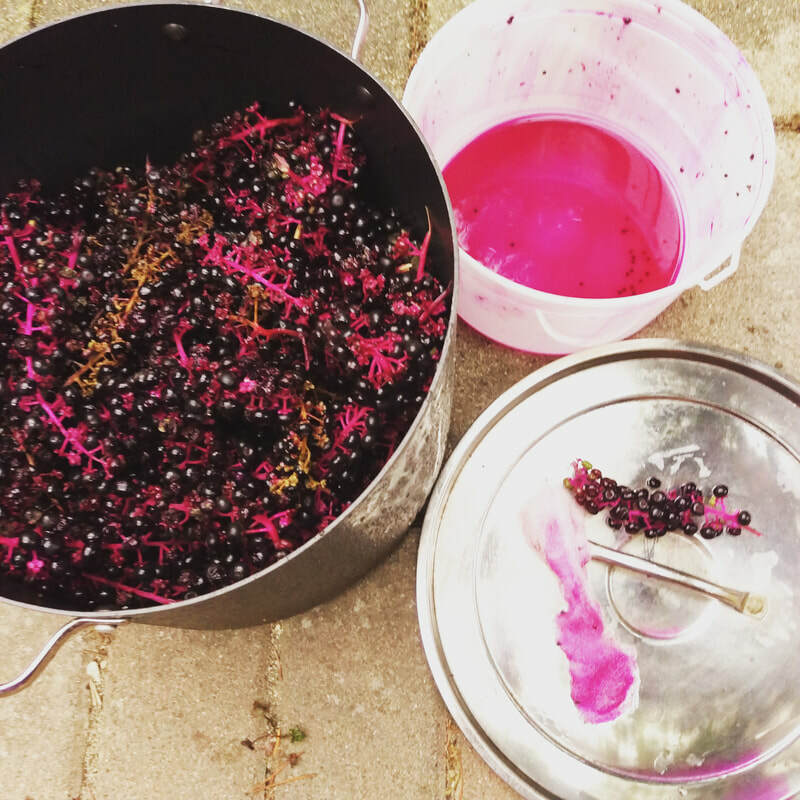 Here in British Columbia, Canada's Pacific Northwest, we are blessed by mild temperatures year-round which allows me to grow some of the dyes in my own garden. We are equally blessed by the proximity of some good sheep breeders. Fairy Tale Wool sources its wool mostly from Saltspring Island, the biggest Western Canadian Gulf Island. There is a long tradition of excellence in the quality of wool and the variety of breeds. Maria Horback at ﻿Wet Woolies Farm﻿ is my main provider, augmented by Margret Thomson's herd of Cotswold sheep at Windrush Farm. and Brenda and Bill Hamilton's Alpaca farm in Nelson, BC. The latest addition to the team is Mohair wool from Cole's Farm in the Cowachin Valley on Vancouver Island as well as from Cedar Grove Ranch in Southern Oregon, and local alpaca from Roberts Creek, BC. My deepest gratitude goes to Dorothea Fischer in Germany who has been my greatest inspiration and teacher. Her ongoing research into natural dye substances is outstanding, and thanks to her you are now able to enjoy over 30 different shades of dyed wool! I've previously never used iron for mordanting or dyeing as I found that the fibres suffered too much and got brittle. A new (to me) recipe, though, prevents the damage of using iron by adding a lot of cream of tartar to the mordant which in turn allows me to produce a true black on wool (see picture below). 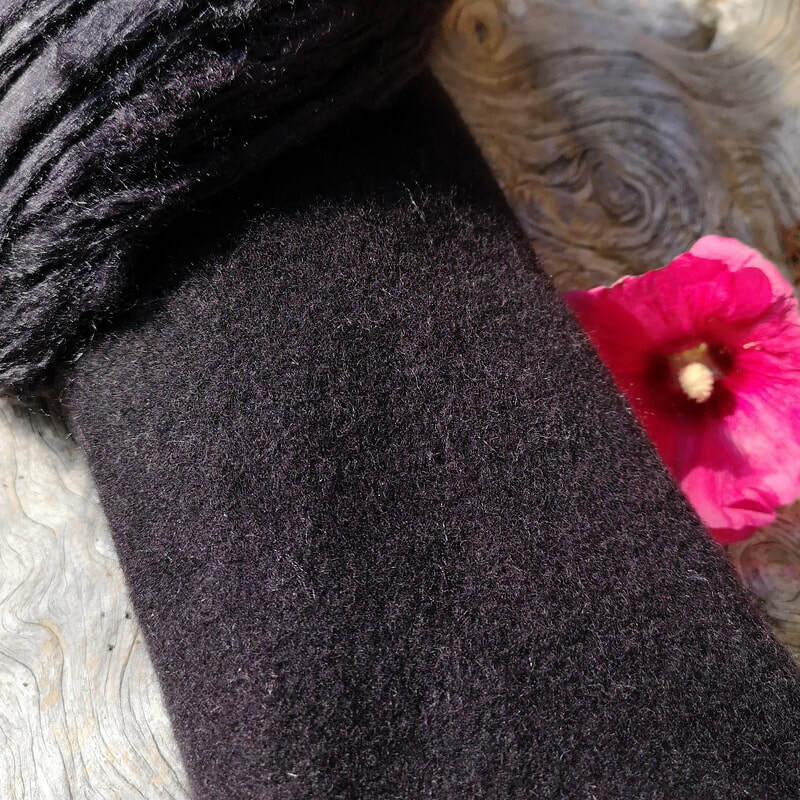 Therefore black will be available as a shade for all my wool products, effective immediately. All-naturally dyed multi-coloured and/ or speckled one-of-a-kind yarns are now available as custom orders for a minimum of 300 grams on a base of your choice. Please get in touch through the 'Contact Us' page for details and prices. Another round of Phatfiber contributions went out, celebrating the box's 10th anniversary with the theme 'Winter Wonderland'. My contribution is a lock spinning set called 'A Winter Walk', a mix of naturally white Arizona Rambouillet roving, Gotland locks and naturally dyed Cotswold locks (see picture below, left) These are surprise boxes, supporting and promoting small fiber businesses, an ingenious way for fiber enthusiast to receive samples of beautiful and sometimes one-of-a-kind rolags, art batts, skeins, stitch markers, patterns, buttons, kits and even lovely goodies such as tea, bath crystals, candy, etc.! Take a look at my contributions in the Etsy shop, marked with 'Phatfiber'. ​Due to technical problems at the mill, the alpaca yarn base that I had been waiting for turned out quite differently than anticipated. It's a DK yarn with a thick-and-thin texture which is beautifully soft but sturdy. The alpaca fiber came from a farm not more than 10 kilometres away which makes me extremely happy. And first dye experiments turned out very satisfying (as you can see in the picture below on the right). So if you're looking for a more lively texture, you can be looking forward to more one-of-a-kind naturally dyed colourways.